Not widely offered in nurseries Sonchus are an excellent addition to the garden. Grow then for the masses of yellow flowers, as well as for the attractive foliage. They attract bees and Butterflies to the garden and are easy care. The beauty of these plants is that will flower well in part shade and do not require much extra water. 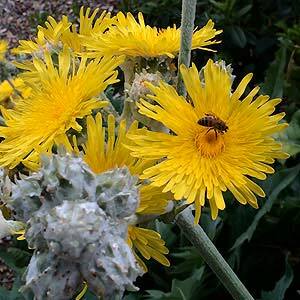 Sonchus acaulis and Sonchus arborous are two ornamental perennials grown for the foliage as well as the yellow flowers. Sonchus acaulis (pictured right) is low growing with flowers that appear held well above the foliage in spring to summer. Growing in part shade to full sun they do require a well drained position, particularly in winter. So. palmensis – Tall and upright. S. canariensis – Taller growing to 3m.